The Los Angeles teachers union may have just ended a lengthy strike over a contract dispute, but could soon find itself back in court as a local educator filed a class action suit over forced dues. A public school teacher has filed a class action suit against United Teachers Los Angeles, alleging that it illegally subjected her to a strict window period for resigning her membership. The teacher attempted to cut off her dues payments following the Supreme Court's Janus ruling, which declared mandatory fee payments unconstitutional, but was rebuffed by union officials. The suit argues that the "restrictive" resignation policy violates the First Amendment rights of teachers. "After being notified of Seager’s decision to revoke any prior dues authorization, Los Angeles District and UTLA, directly or indirectly, nonetheless continues to deduct dues from her paychecks, in furtherance of UTLA's restrictive revocation policies," the complaint filed by the National Right to Work Legal Defense Foundation says. "Unless enjoined from so doing, UTLA and Los Angeles District will continue to collect/deduct union dues from employees." UTLA did not return requests for comment. The suit was filed on Tuesday evening after the union finished a six-day strike that left half a million students out of school. The school district offered the union several key concessions, including a prospective cap on charter schools—which often operate without unions—in the city, as well as an effort to cut the number of standardized tests used to evaluate student progress. The work stoppage cost as much as $125 million, according to Bob Wickers, a vice president at the pro-free market Freedom Foundation. "If the public has to pay for these government union deals, the public should have access to the labor negotiations," Wickers said. "It is irresponsible for the second-largest school district in the country to negotiate for two years behind closed doors and then simply hand taxpayers the bill." UTLA managed the concessions based on its political influence, which derives from its ability to collect dues, according to Wickers. He was not surprised by the union's resistance to enforcing the Janus rights of district teachers, saying labor leaders "are mad because they’ve lost a lot, and they’re fighting back." Mark Mix, president of National Right to Work, said the Los Angeles suit is just the latest in a number of improper dues collection practices. The continued dues deductions from dissenting workers violates the rights of the people UTLA claims to represent. The aim of the suit is to not only win for local teachers, but to raise awareness about the Janus ruling and remind workers they no longer have to pay union dues or fees as a condition of employment. "Even after the Supreme Court’s ruling union bosses continue actively violating the constitutional rights of the very rank-and-file teachers and other public employees they claim to speak for," Mix said. 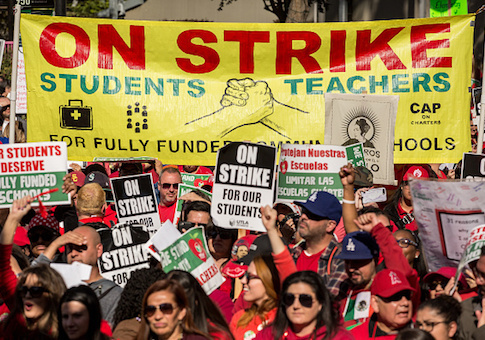 "Every teacher subjected to the union's strike demands needs to know that not only do they have the legal right to resign from union membership and return to their classroom to teach their students, but that under the Janus precedent UTLA officials cannot legally force them to continue dues payments after they've resigned." The suit seeks to recover back dues for all teachers who have attempted to resign from the union. Similar class action suits have been filed in other states, ranging from Minnesota to Pennsylvania, and some unions have already begun settling Janus cases by returning past dues and terminating withdrawal restrictions. This entry was posted in Issues and tagged Teachers Unions, Unions. Bookmark the permalink.